Staff photo by Matt Fields-Johnson/Chattanooga Times Free Press Parts of Lee Highway are included in the Brainerd Road Corridor plan. City streets lined with trees. An interpretive center filled with Cherokee history. A new library branch that could be a model for an entire city. Those are some visions for a newly revitalized Brainerd area, dreams that are closer to reality after Mayor Ron Littlefield signed off on part of the project during his recent State of the City address, officials said. "The cemetery there is a jewel," Mr. Littlefield said, "but we need to build a bigger footprint around it, build a bigger public space." 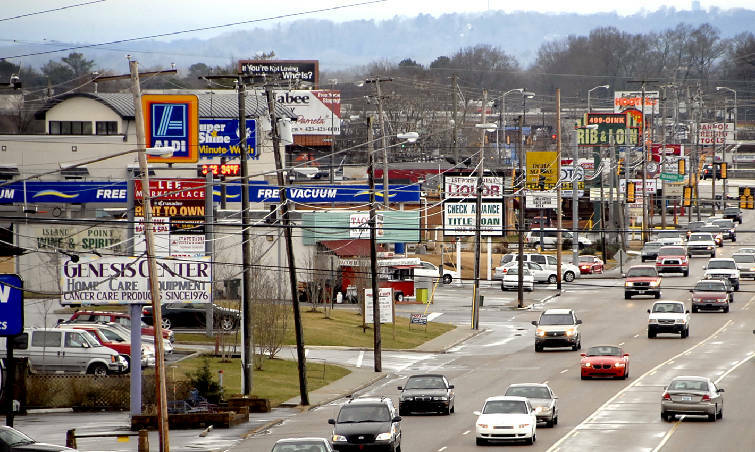 Months ago, a visioning committee led by City Councilwoman Carol Berz unveiled a plan for revitalizing the Brainerd Mission, Brainerd Village and an area around the Chattanooga Metropolitan Airport on Lee Highway. The plans call for an expanded park around the Brainerd Mission, a historical interpretive center and a new library branch. The plans also call for community gardens and a farmers' market near the airport, an expansion of the South Chickamauga Greenway and more trees and overall green space in the area. During his Feb. 4 State of the City address, Mr. Littlefield called for the building of a model library branch in the area and revitalization of the Brainerd Mission. He said he would enlist the aid of the Washington, D.C.-based Partners for Livable Communities to help with the efforts. He said he could not give any specifics on when the city would begin its efforts. But he said there are at least two buildings in the area that were abandoned, and the city might trade property for those buildings. City officials said representatives from Partners for Livable Communities would be in Chattanooga in coming weeks. Dr. Berz, who represents the Brainerd area on the City Council, said last week that the Brainerd Mission anchors most of the redevelopment plan. She said some steps already are under way. The old Target building on Lee Highway has been demolished. According to the plans, a new office building could go on the site with the community gardens and farmers' market next door. She said Eastgate Town Center has undergone some renovations, and Brainerd Village is looking at updates. "All of a sudden, all these pieces have energy," Dr. Berz said. But the Brainerd Mission is key, she said. The mission was what started her dreaming about revitalization of the area in the first place, she said. She said she sees this year as being one of planning how to get the library branch, park and interpretive center accomplished. Jon Coddington, director of urban design for the RiverCity Co., helped create the vision's master plan. He said the Brainerd Mission creates the infrastructure needed to act as a catalyst for further growth in the area. In the early '90s, a plan called Imagine Eastgate was devised for revitalization of Brainerd, officials said, but it never came to fruition. The plan was too visionary, Mr. Littlefield said, and the new plan has a better chance to be carried forward because it is more realistic. For the plan to be carried through, the park, mission and library all need to come together almost on top of each other, Mr. Coddington said. "It's the synergy," he said. If just one part is built without the other, it could "just sit there without the energy needed," Mr. Coddington said. David Barlew Jr., designer for Barlew Architects, has worked on the project. He said if the park, library and interpretive center were built, he could see that having the same kind of effect on the Brainerd area that Miller Plaza and Coolidge Park have had on the areas around them. "It would have a domino effect," he said. Nan Zamata, chairwoman of the Eastgate Library Advisory Committee, said the group held a meeting Thursday night about the city stepping in to help with a new branch. She said there were many questions about what role the group could play with Partners for Livable Communities. "We don't want to compete, we want to complement," she said. She said she believes the work already done should help speed some things along. Partners for Livable Communities will have a plan at its fingertips, she said. "The overall thing is that it gets done," she said.